When I was 18 and was an exchange student in Colorado we read the book Animal Farm, and one of the characters is the horse. The motto of the horse is I will work harder, but regardless of how hard it works it does not end well for the horse, here it was the pig who where the smartest. Regardless if you have read this book or not it was this allegory that caught my mind when I was thinking about how we best could describe the improvement we have just made when it comes to working with the legislation changes. The important thing is to work smarter and not just harder. We can provide you with both general and specific monitoring e-mail alerts. You can get a general update of all Environmental and Health & Safety legislation, an e-mail with only the legislative updates from your register – or – only the updates for a specific tag in the register. For some time you have also been albe to get a blue button in your e-mails where you can state that you have read the mail – a sort of confirmation that you are aware of the changes. Everything that has been confirmed are collected in the confirmations page which you can access from the top menu legislation updates. As you might know there is an updates view next to your register where all the amendments are presented with a number of filter possibilities. 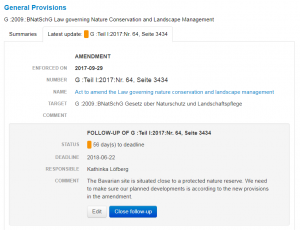 In the register you can also view the latest amendment next to the summary description. The most recent is presented first and you can drill down to older amendments if needed. Now we come to the smart working part. All amendments and new legislation that we report on are not relevant for you. In some cases it can be smaller adjustments or formalities that we need to include so that the system is complete. In other cases the relevance can depend on who you are, what your responsibilities are and how you work. By selecting only the changes that are of most interest to you you get a list that you can priorotize. You can therefore in a smarter way use your energy to work on the right things. One of my team members describbed that our energy is like a bag of raisins. If you use too many you run out and only have an empty bag. We therefore need to think both on how we use our raisins more wisely and how we can get new fresh ones. Regardless of where you start you can now write your comment about what to do, asign a responsible person that can be you or someone else and set a deadline when the task should be finished. With our traffic light model the Natlikan Compliance Tool keeps track of your performance and you have access to the follow-up from all three places, i.e. the register, updates and the follow-up view from the top menu. More information on how follow-ups works and how you can work smarter are found in our support articles online. You can find them directly from the footer. Welcome to a smarter way of working!